Celebrate the magic (and mischief) of the Harry Potter films with this finely crafted desktop stationery set inspired by the colors and logo of Fred and George Weasley's magical joke shop! 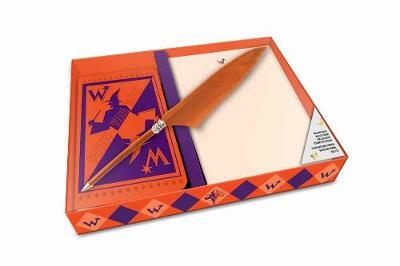 Designed to look like a real Weasley's Wizard Wheezes product, this collectible set includes a 128-page pocket journal, twenty sheets of letterhead paper and envelopes--all printed with the eye-catching Weasley logo--and a quill pen. Showcasing vibrant graphics and concept art from the beloved films, this desktop stationery set invites fans to show their love for everyone's favorite wizarding family!